This amazing TV is definitely a dream come true for all consumers as it boasts loads of jaw dropping features. This wonder product from Samsung is a complete package in itself with its enhanced visual brilliance, 4K display, Smart Wi-Fi powering, amazing sound quality, and much more. If you consider all the features this TV packs, it is definitely worth your money, and one of the best choices for your home theater set up. Every program lined up for TV broadcasting is unique, from night life of animals to live sports, from laughing gags to news reporting, from candid chat shows to soap operas. Even though the picture quality on this TV is a pretty mixed bag (it boasts amazing viewing angle as well as low motion blur, but has bad uniformity and pretty poor blacks), it is still an amazing SUHD TV with lots of incredible features. The idea of converting your television into another smartphone is implemented in this TV, therefore the Samsung UN55JS7000 is also known as a Smart TV. You are able to pair it with your Samsung Galaxy smartphone for unrestricted and easy content streaming and sharing. You are allowed to sync your TV to your smartphone as well as to perform mobile streaming thanks to the Easy View 2.0 feature. Furthermore, the quad-core processor on this TV makes web browsing much easier so the Smart TV platform on this one is performance and aesthetic oriented. Even though this model from Samsung is not equipped with their new Tizen OS Smart Hub like some top Samsung JS models, it still gets a pretty similar Smart Hub with great Apps selection. Samsung has done a really great job with their intuitive navigation and user interface which is extremely easy to navigate and understand. This Smart Hub provides different users with the ability of having their own programming and Apps appear which is a really nice plus if you live in a home with several TV users. The Smart Hub for this TV involves a full web browser, and a highlight in Apps choices would probably be the HBO Go. The charcoal brushed metal frame on this TV of around a half an inch is attractive and simple. The V-shaped stand included with the TV is made of plastic, and is also charcoal. Just one glance at the Samsung UN55JS7000 is enough to notice its elegant and stylish looks. The physical dimensions of this TV are proportional, and the height, length and width balance properly. The regular measurements for this TV without the stand are 48.9 x 28.3 x 12.8 inches, whilst with the stand 48.9 x 30.3 x 12.8 inches. In addition to this seamless design, 3 USB ports and 4 HDMI ports make this ultra-smart TV a really smart buy option. It is easy to attach the stand to the TV, and the jet black color as well as smooth glossy finish makes the TV look classy and elegant. To start with, this TV isn’t the best one for watching movies since there are some issues with the uniformity and the blacks are not really deep. 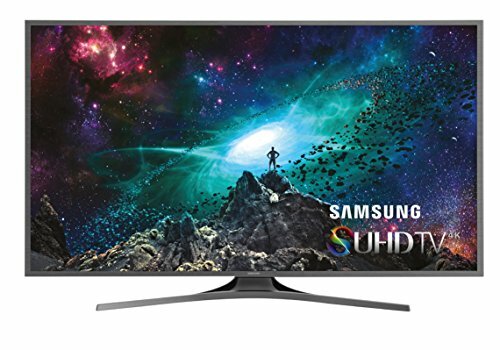 So, the Samsung UN55JS7000 will not look the best if you watch it in a dark room. It also has some judder while playing 24 fps movies meaning it probably shouldn’t be the first choice for those who love watching DVDs, streaming movies, Blu-rays, or some other 24 fps movies. However, this TV really stands out when it comes to video games and watching sports. Even the fastest moving scenes will look great as there is barely any blur. For those game addicts who are looking for a TV that doesn’t lose much color saturation when viewing from side angle, this is definitely an amazing TV to buy. If you like to play competitive games, this TV is a great choice as there is minimal amount of blur, as well as no noticeable delay between producing an action in a game and viewing the reaction onscreen.